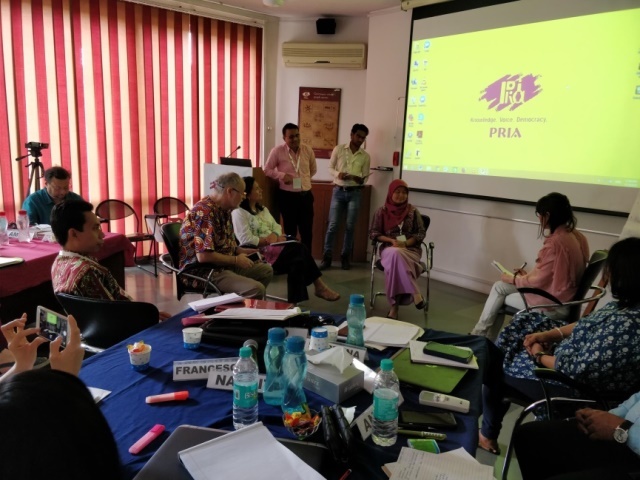 The second phase of the Mentor Training Program (MTP) under Knowledge for Change (K4C): the face to face residency, kicked off in PRIA, New Delhi on March 11, 2018. 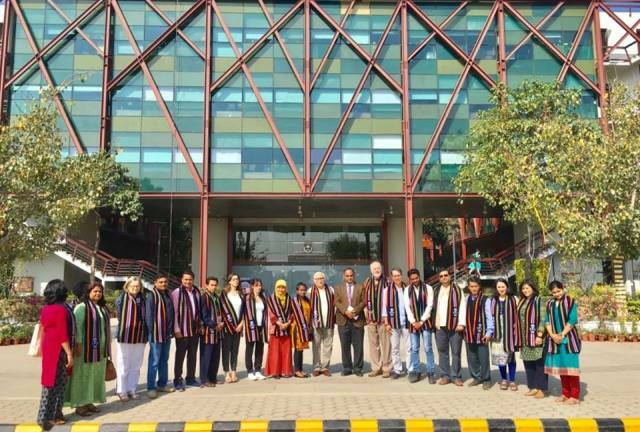 The residency brings together 19 mentors from 6 different countries/CBPR training hubs (Italy, Colombia, Cuba, South Africa, Indonesia and India), for a two-week rigorous training program for building capacities in Community Based Participatory Research (CBPR). 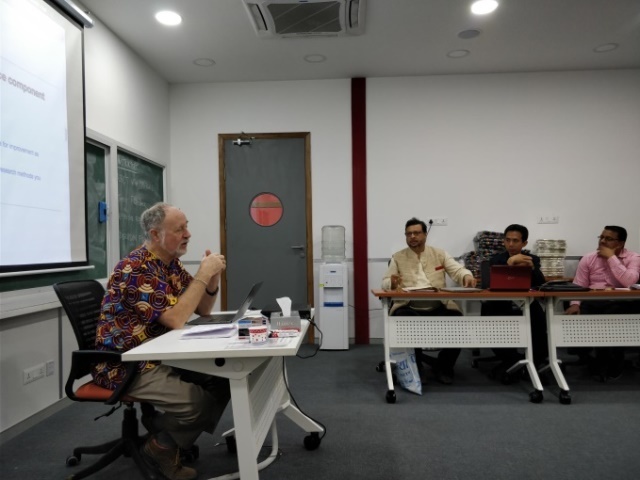 The two-week residency is split between one week at PRIA & the second week of the program will be hosted at one of the Indian hub members, the O P Jindal Global University. 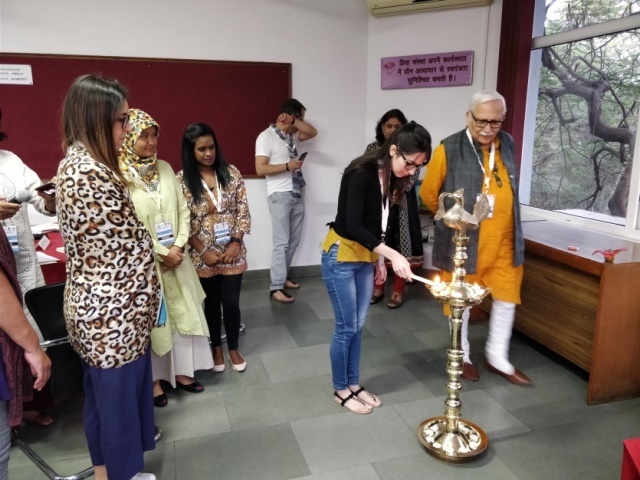 The residency began with an introduction on March 11, with invoking the blessings of Goddess Saraswati (goddess of education and knowledge) and lighting the lamp. Following this were informal introductions, a brief overview on PRIA and sharing of the outline of the program. The residency in essence began on March 12, and will complete on March 23, 2018. 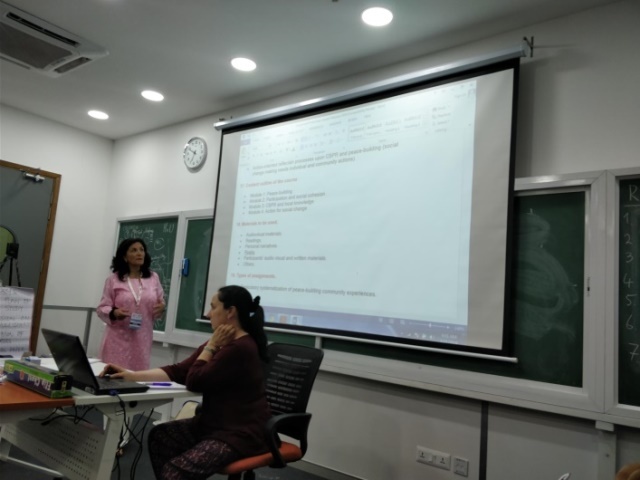 During the training, the mentors are being trained in various aspects of CBPR, and its theoretical and practical implications in an attempt to build capacities of future CBPR mentors, teachers and researchers. The various sessions included discovering the meanings of the word ‘knowledge’, exploring its interpretations in different languages and contexts and critical reflection on self. Each of the sessions is designed in a way to ensure maximum participation of the mentors in the process of facilitating their CBPR learning’s. 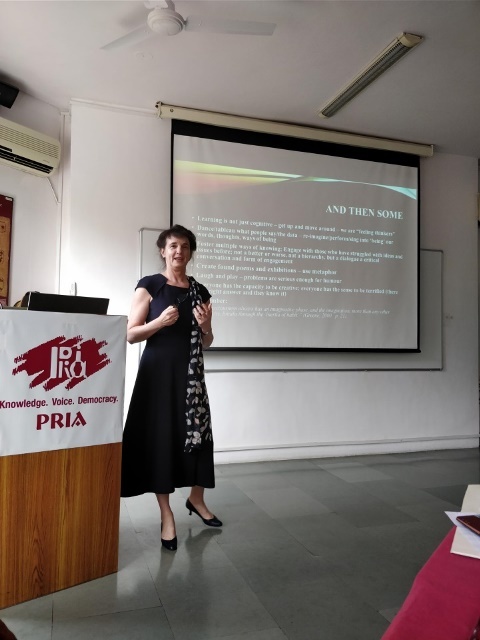 The first week of the training also saw a couple of stimulating presentations by Dr Darlene Clover, Professor, University of Victoria on modes of enquiry and arts based methods. Here, she detailed out the use of different modes of enquiry in a CBPR process, and importance and value of using arts-based research and also its practical applications. Interspersed within her presentations were presentations by different hubs on different modes of enquiry in a manner that they will use to teach the same, in the CBPR courses to be launched in each of the hubs, going forward. While the PRIA mentors and the mentor from Jindal Global University, collectively made a presentation on Feminist Research Methods, the Indonesian group presented the survey methods; Durban mentors spoke about Institutional Ethnography; Raipur mentors made a presentation on case study as a mode of research; Colombian mentors presented on Photo-Voice; Italian mentors presented on Critical Discourse Analysis and lastly, the Jaipur mentors made a presentation on Narrative enquiry. Going forward, this week will also witness detailed discussions on the field work that the mentors are expected to undertake as next steps in the course. Further, on Saturday, March 17, 2018, there will be a public lecture by Dr Wangoola Wangoola Ndawula, Founder & President of Mpambo African Multiversity on ‘Indigenous Knowledge Traditions’. 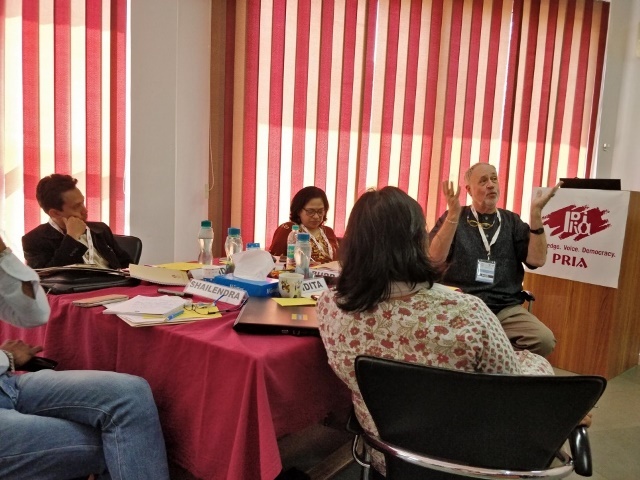 For the second week of the F2F residency, the cohort of mentors along with facilitators Dr Budd Hall and Dr Rajesh Tandon moved to O P Jindal Global University, Sonepat, Haryana to spend the rest of the week. The week kick-started with a very stimulating conversation with Prof Raj Kumar, Vice-Chancellor, JGU; who apprised the group of the history of the university and also shared about the Indian Higher Education System. Further, after a session on ethics, the group then split into two and spent the day at two field sites in Sonepat and Haryana, where they learned about PRIA’s Kadam Badhaate Chalo Campaign, and met some very bright community youth leaders, who shared their experiences and also engaged in a conversation with the mentors. The rest of the week was dedicated towards group feedbacks from the teaching sessions that took place at PRIA, individual feedback on the competencies, and design and finalization of individual field projects and CBR courses to be launched in the hubs. The last of the residency witnessed an interaction with the Registrar, Prof Y S R Murthy, who felicitated the mentors and also some group feedback on the MTP course, which were duly noted by the facilitators. The group then bid farewell to each other and JGU and moved on to their respective locations and countries, with a promise and commitment to build a string, vibrant and responsive K4C hubs in their own contexts.